We invite people from all spiritual/faith traditions who recognize fracking as an environmental, health and moral issue to join us. Come meditate/pray or provide support by bringing banners and helping distribute information. On May 1 (2017), the fracking moratorium in unincorporated Boulder County ended, allowing permits to be submitted. The health of our ecosystems and our children are in danger, and fossil fuel extraction will continue to compound climate change. The regulations proposed by the Boulder County Commissioners will not be enough to provide protection from the dangers of fracking. What do we plan to do? We will Pray-Meditate the Frack Out of Boulder by raising awareness and inspiring collective action to put the government and the oil and gas industry on notice! Chautauqua trailhead and Pearl Street gatherings on here, here and here. –We will create a sacred interfaith altar. Please bring objects, prayer-beads and/or images that are sacred or otherwsie meaningful for your sacred-activism. –If you intend to sit down to meditate or pray, bring a cushion and blanket or back-jacks. 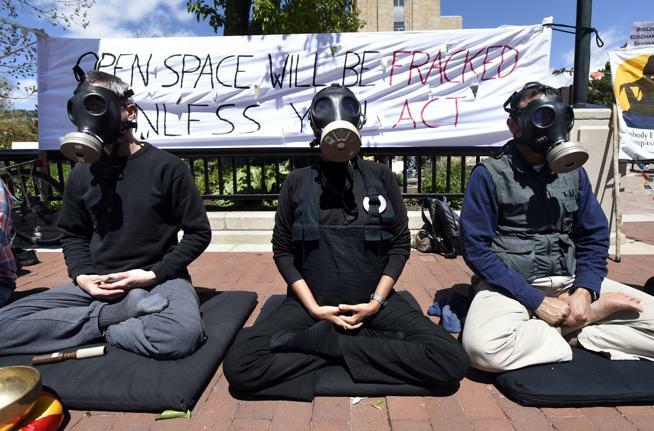 –Bring fracking-specific banners or signs if you would like to wear them while sitting. We will have supplies to make signs on hand as well. –Bring water, hat (it can be very hot & sunny) and a jacket (in case it is windy). –Bring gas masks, if you own one, to symbolically highlight the impact of fracking related pollution on our health. We will provide small paper masks. –If you are joining the meditators, please maintain a contemplative/prayerful spirit that allows for inner transformation of our heart-minds. This is not just about changing opinion of others but transforming ourselves in the process. Prepare to remain mindful or prayful even if you are not joining those who are meditating. –A gong will sound every 10 minutes over the entire 90 minutes signaling start and end of meditation periods. We will have songs and prayers as well. –Organizers will distribute information and action items as well as help direct adults/children to appropriate meditation spots or activities. Please let us know if you would like to volunteer or if you are bringing kids. –Be kind; this is a peaceful action based on our love of Boulder and love for all beings even those don’t agree with us. –Transportation: Please note that Chautauqua is very busy on Sundays and has limited parking. Consider taking the HOP bus, biking or carpooling. For Pearl Street, the SKIP runs every 10 minutes along Broadway. Organized by Boulder EcoDharma Sangha; Inspired by Buddhist Peace Fellowship; Supported by Boundless in Motion, Moms Clean Air Force, Naropa Peace Studies, Adi Shakti Center and Our Sacred Earth and other grassroots organizations in Boulder County.